Location: A9 exit Trockau, 3.5km southwest Ahorntal-Kirchahorn at the castle Burg Rabenstein. 45km NNE Nürnberg. 1830 banquet given for Ludwig I., King of Bavaria, in the cave. 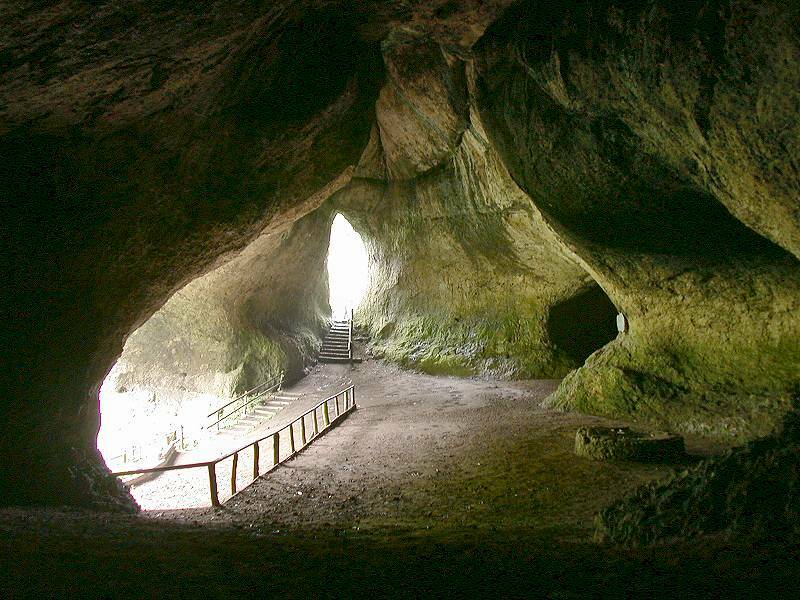 Caver renamed Ludwigshöhle for his honour. 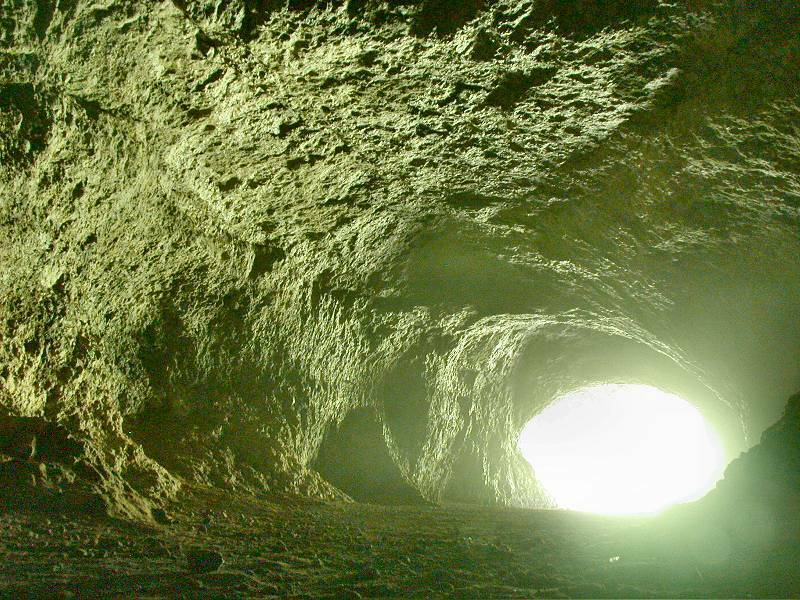 Image: almost the whole cave. 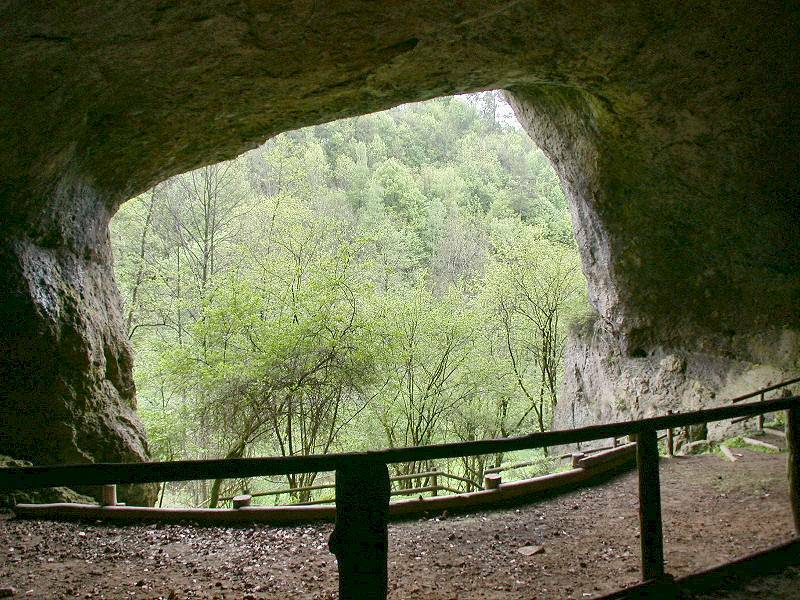 The Ludwigshöhle (Ludwigs' Cave) is one of the biggest caves of the Frankian Jura and also easy to visit. It is a cave ruin, the last remain of a huge cave which was destroyed by the river. 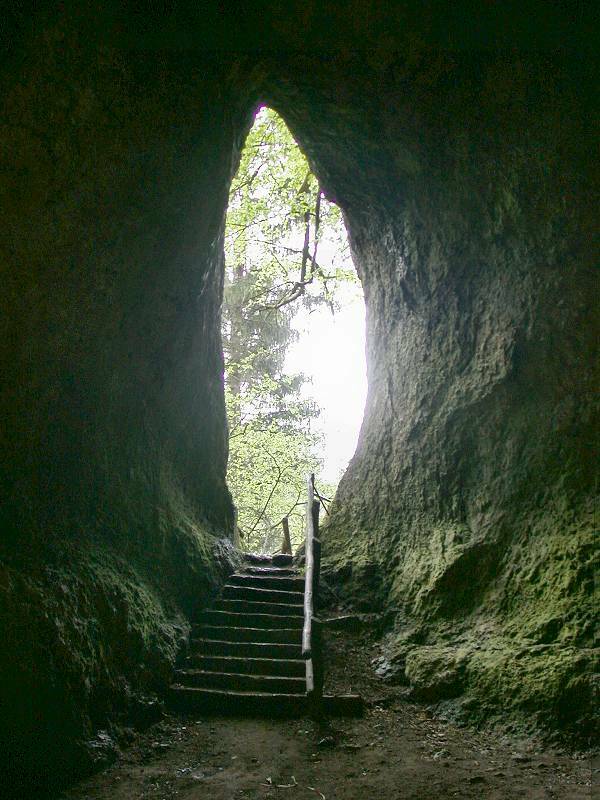 It is located in the Ahorntal, opposite the Sophienhöhle. This cave is only 50m from the parking lot for the Sophienhöhle in the Ahorntal, across the small river. Approaching the cave, the visitor has to walk up a hill at the foot of the cave portal. The single huge hall is much wider than deep, has a short continuation to the right and a second one leading straight into the rock at the left side. 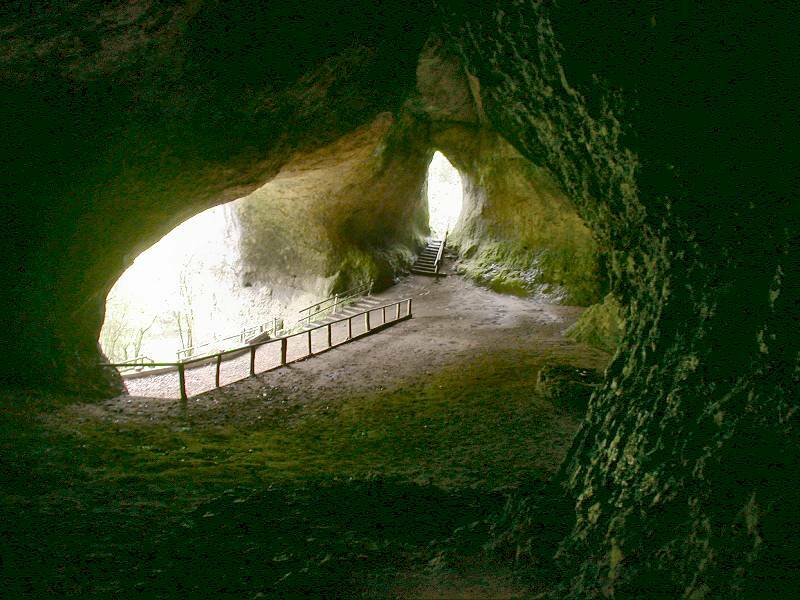 Here is also a socond cave entrance where another trail leaves the cave. So this is a real through cave with an official trail going through. The cave was used for centuries, and so it was massively altered by its owners. Especially the floor was leveled, creating terraces for cave festivities, and wooden rails were installed. 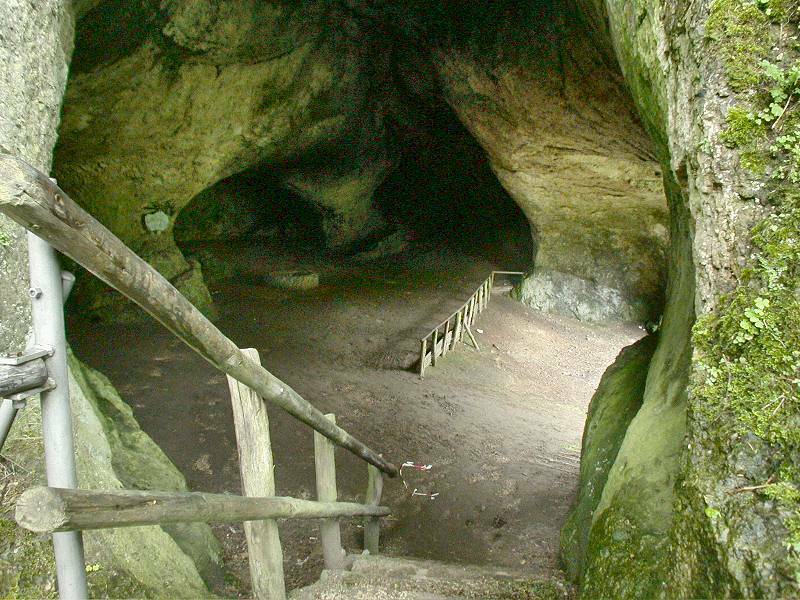 The cave was used by hunting parties. Unfortunatel this alteration destroyed the archaeological and palaeontologic remains which were thrown away carlessly and form the huge hill at the foot of the cave. Although this sediment definitely contains a lot of bones, it is not of interest to science becaus of this relocation.